EUS Ski trip is the hottest event of the year. The trip takes place over the 3rd weekend in January. 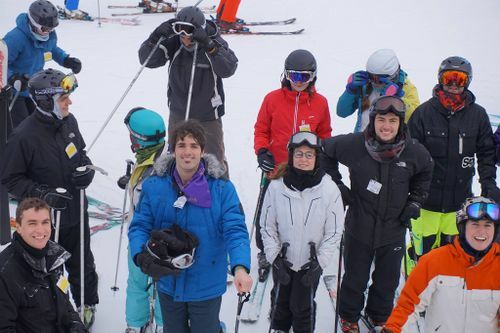 56+ McGill Engineers hop on a coach bus and travel to Mount Saint Anne for 2 days and 2 nights of gnar skiing, snowboarding and fun party times. The EUS Ski trip is a great opportunity to shred some pow and chill with new or old friends. The event is always a hit and sells out so make sure you buy your ticket early! The first EUS Ski Trip was held in 2001. An annual trip has been held every year since then making the 2017 trip the 16th Annual Trip. In December 2015, the cabin the EUS Ski Trip typically went to burned down, to be clear, we didn't burn it down. Thus a new cabin was born with special locations like the lab and a mystical hot tub. This page was last edited on 5 February 2019, at 17:08.